I’m in the process of fitting dynamo lights to my wife’s bike and to mine. For our rear lights, I chose a light I hadn’t seen before: the Herrmans H-Track. It’s relatively cheap but seems to have good reviews. It meets all the relevant standards, if you care about that sort of thing. A quick test on the bench showed that it was nice and bright, and the illuminated ring round the outside is eye-catching. The standlight works quite well but stays lit for a long time (around 15 minutes, I’d estimate), gradually dimming until it gives up. That’s not as nice as the B+M DTopLight I have on another bike, which stays lit for the requisite four minutes then switches off. I was curious to see if it was possible to improve it, so I took it apart. The light is glued together but there are little gaps between the two halves at the bottom, which make it relatively easy to lever apart without damaging it. Here’s what’s inside. 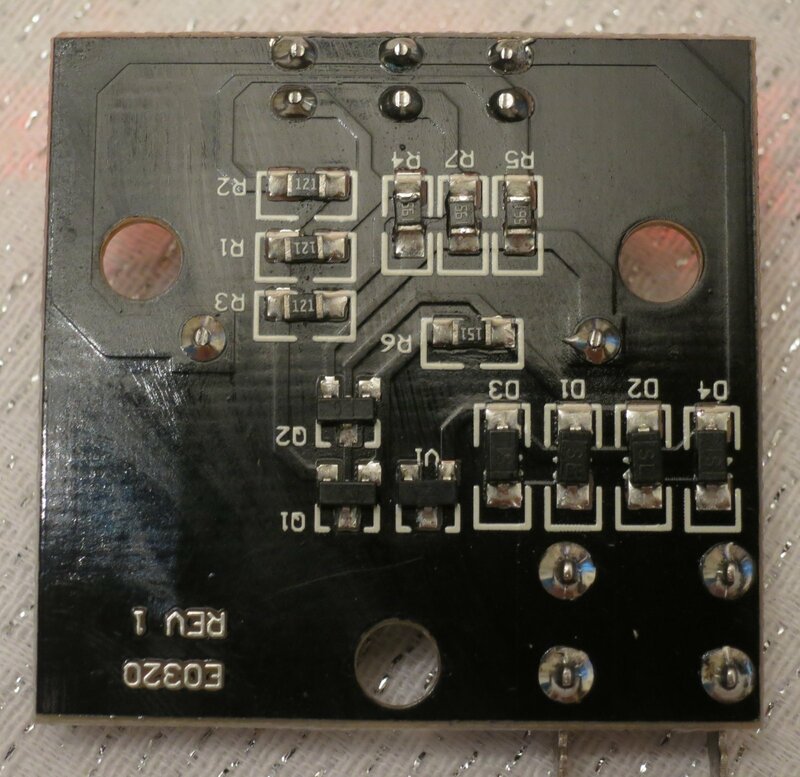 A little PCB with not much visible – three LEDs and a capacitor. It’s nicely made, with a fibreglass PCB, but there’s no waterproofing or other sealing. The rest of the components are surface-mounted on the other side of the board. I noted in passing that neither of the wires is connected to the mounting screws, which is handy for lighting systems like the Solidlights 1203DR which need both wires to the rear light to be isolated from the frame. Here’s a closeup of the PCB. Not a lot to it, really. You get what you pay for. 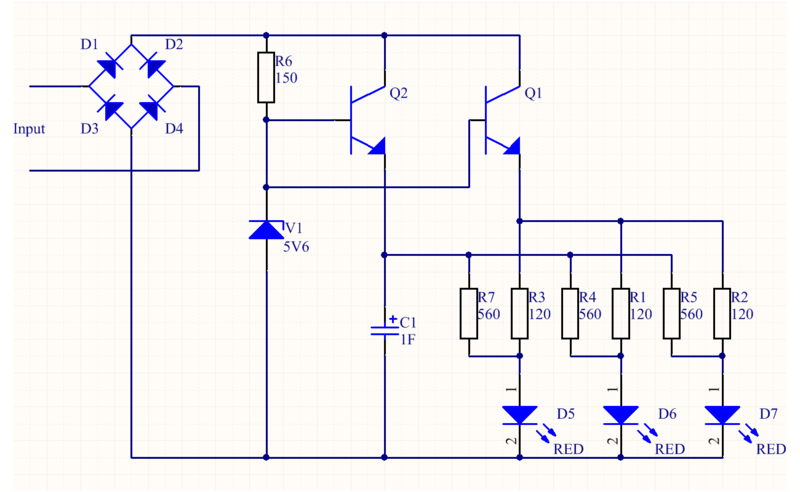 For the curious, here’s the circuit diagram I traced out. 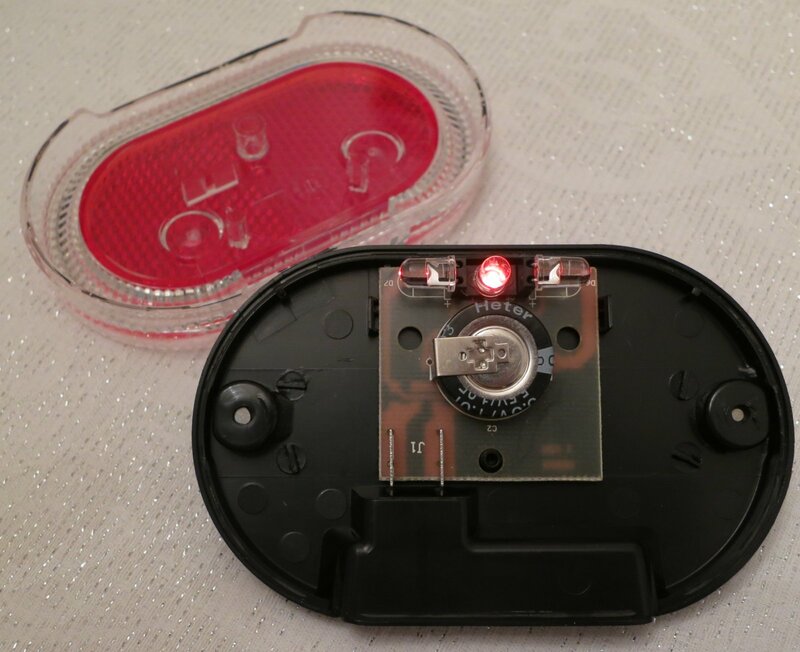 It’s clear that the H-Track doesn’t have any protection against overvoltage, so you’re in trouble if your front light comes disconnected. What about improving the standlight behaviour? Well, I’ve worked out a modification for that but haven’t tried it out in a real light yet. Watch this space. 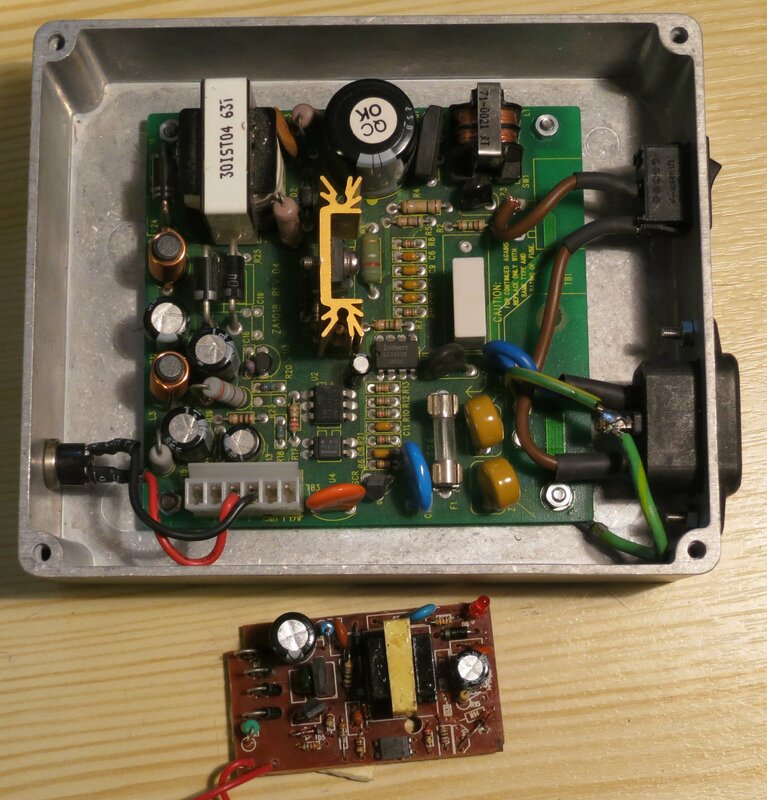 This entry was posted in Uncategorized and tagged cycling, electronics, teardown on December 29, 2013 by martinjonestechnology. From the department of over-engineering comes this: a SheevaPlug power supply to end all SheevaPlug power supplies. I’ve got fed up with power supplies dying. First the SheevaPlug’s infamous internal one only lasted a few months, then I think two wall-warts expired in turn. Most recent was the horrid little one at the bottom of the photo, which didn’t come back on after being switched off. It also generated so much radio interference that it actually stopped the touch pad on my laptop working. No joke. The new one is at the top of the picture. Its outputs are rated at 5V, 2.5A, and 12V 1A. The SheevaPlug draws about 0.8A from 5V at rest, so the new power supply should live a long, cool, reliable life. I hope. Also to help with cooling, I fitted it in a spacious metal enclosure bought from the convenient Warszawska Gielda Elektroniczna. Let’s see how long it lasts. This entry was posted in Uncategorized on December 17, 2013 by martinjonestechnology. This blog was originally supposed to be about what’s going on in my workshop. However, this post is about what’s going on in someone else’s workshop – the garage which is currently working on my Land Rover. I’m putting it here because it’s an interesting engineering lesson. My Land Rover’s 300Tdi engine is very badly broken, and apparently it’s all because of the failure of the ‘P gasket’. This part, which costs £3.24 according to a web search I’ve just done, forms a seal between the engine block and the mounting bracket which holds the water pump, alternator and various other things. It’s supposed to play its part in keeping the coolant inside the engine where it belongs. Trouble is, sometimes it doesn’t. And when the cooling water escapes on the motorway, the engine overheats before you’ve even got time to look at the the temperature gauge. 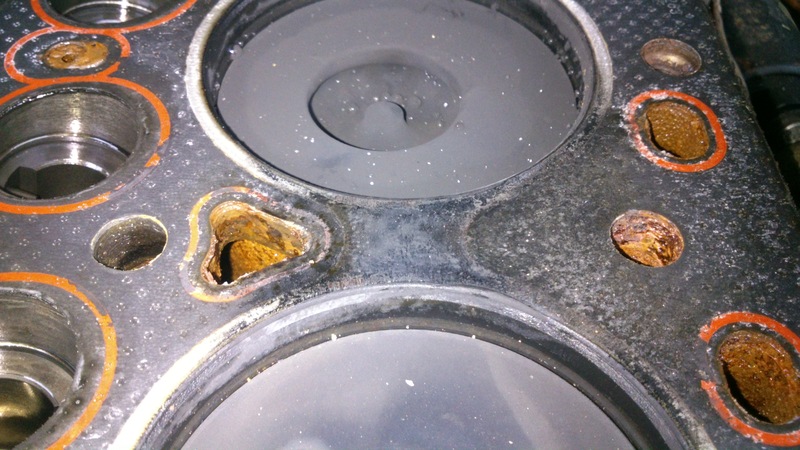 This is an object lesson in the damage an engine can do to itself when it overheats badly. The first I knew about it was that the engine suddenly lost power and then died altogether. I was only able to drift to the hard shoulder in a cloud of steam and smoke. Once cool, the engine would restart but ran badly, making an odd tapping noise, and the Land Rover’s top speed was about 40mph. It’s no racing car, but it’s not supposed to be that slow. Cutting a long story short, the head is now off the engine. Here are pictures of what’s inside. Firstly, cylinder number 4. 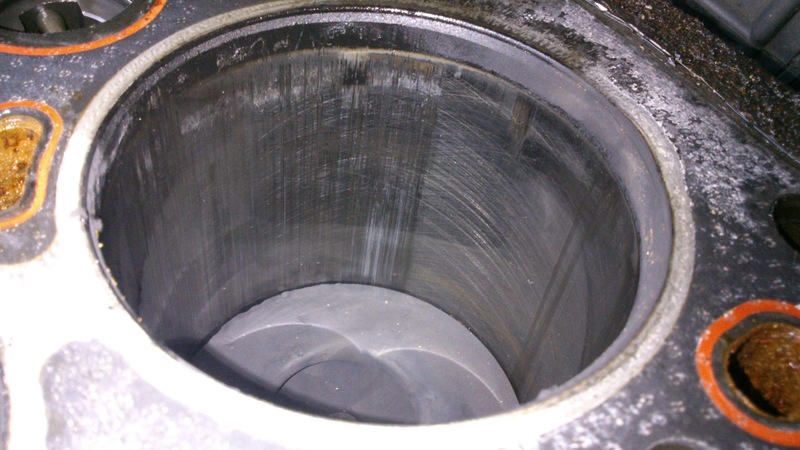 I think this is the reason that the engine stopped: the piston got so hot that it started seizing in the bore, scoring it badly. The score lines are more than just visible, they’re perceptible with a fingernail, too. The other cylinders look OK, but one bad one is enough. That would explain the loss of power. Considering that only one out of the four cylinders was in anything like normal condition, it’s amazing that it still ran at all. I’ve now spoken to several people who’ve said that if a 300Tdi engine has been overheated this badly, the head will be wrecked as well. The search for a replacement engine is now on. This entry was posted in Uncategorized and tagged Land Rover on December 9, 2013 by martinjonestechnology.